Map outline of the rail trail – bike ride. Distance approximately 180 kms. 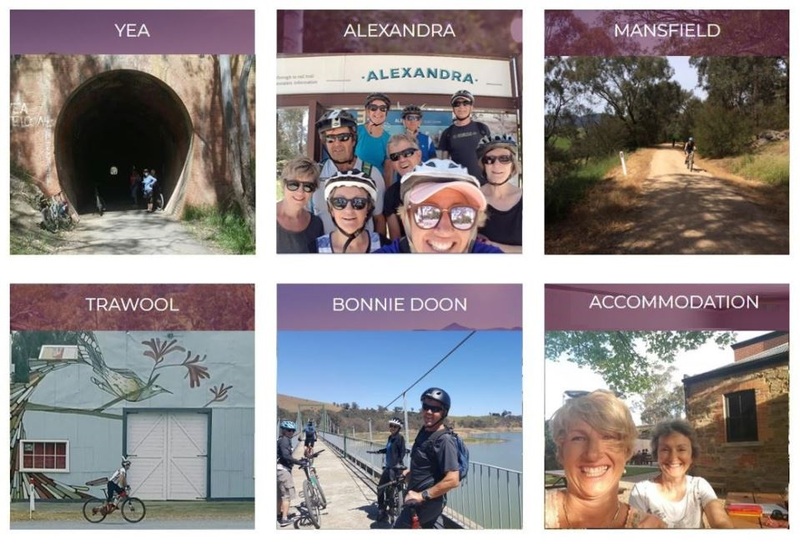 Mansfield to Trawool via Bonnie Doon, Alexandra & Yea. Simone & Robbie, Kath, John & Jacqui, Heather, John & Nikki and Paul setting off from Mansfield. 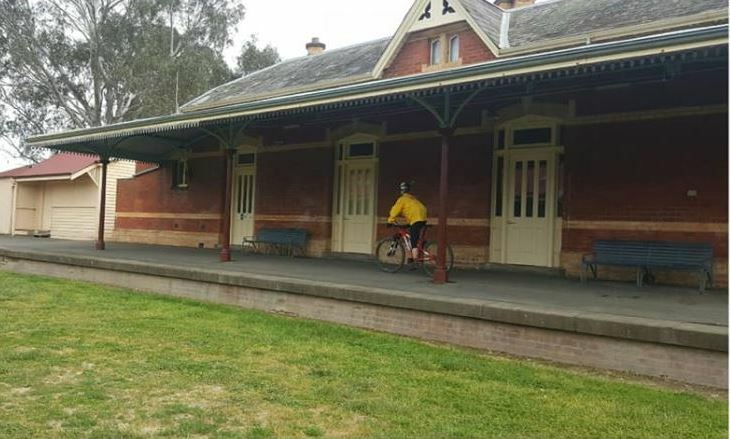 Our Mollymook Swimmers and Partners headed off to Victoria last week for their annual rail trail bike tour. 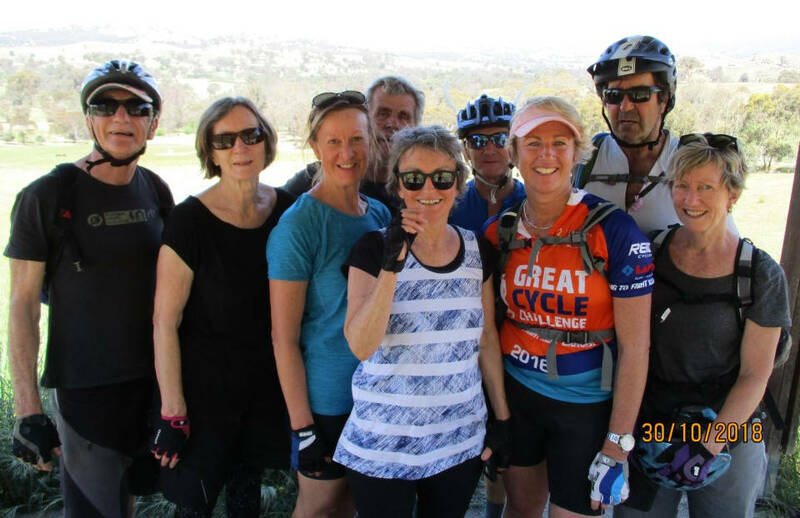 Nikki & John, Jacqui & John, Kath, Heather & Paul, Simone & Robbie gathered for breakfast at a cafe in Mansfield with the intention of riding to Bonnie Doon on the first leg of a 4 day trail. 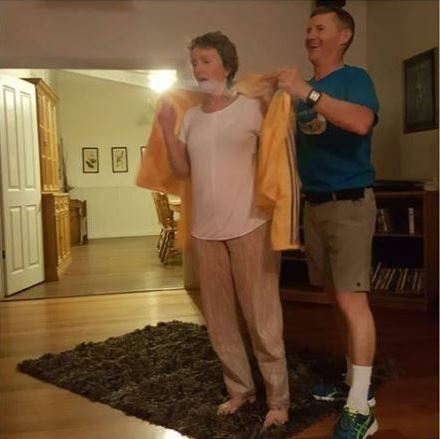 Jacqui was awarded the Yellow Jersey that evening after a delayed start due to an ear infection that required medical attention and a heroic ride regardless of the doctor’s strong advice not to participate. Simone had an after dinner memory game planned based on “The Castle” which featured Bonnie Doon. The group headed off on a ride of over 50 km to Alexandra. Quite a long uphill climb to a high point just outside of Alexandra and then a welcome down-hill into town. Everyone was happy to take a dip in the motel swimming pool on arrival. Heather received the Yellow Jersey this day for a supreme effort toiling up the long unforgiving hills without losing heart and for her amazing organisation of the whole tour. Simone once again arranged the evening’s entertainment with a team game between the Magpies the Cockatoo teams. Starting with an uphill sprint to the previous day’s high point the riders wound back to the main track at Cathkin and headed towards Yea. 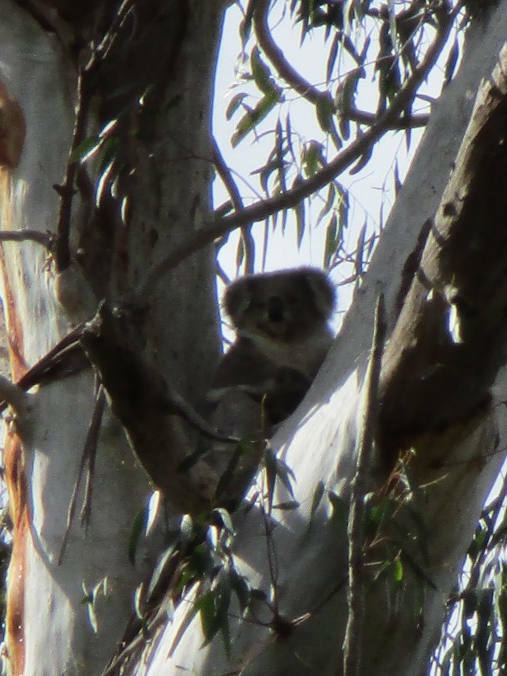 Notable events were the spotting of a Koala by Robbie and the long climb to the Cheviot Tunnel. Once though the tunnel, with bike lights glowing, it was on to Yea. After lunch in Yea and a swim in the caravan park pool to cool down, the local pub was of an obvious choice for dinner. Back at camp, guess who had made plans for more entertainment. Charades this time and a drop or two of wine before a well earned sleep. Yellow Jersey to Robbie for his Koala spotting. The final day. 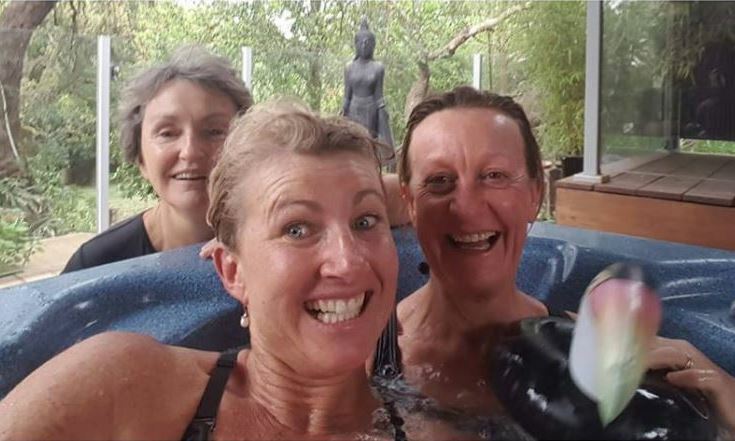 A short 30 km ride to Trawool and a wonderful stay at cottages that included a spa pool and complimentary port and chocolates. What a treat this was! 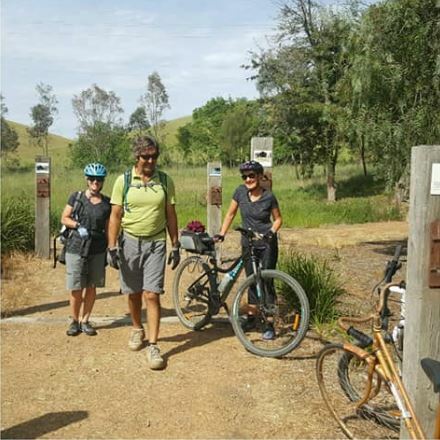 After lunch it was decided that a ride to Tallarook was called for. 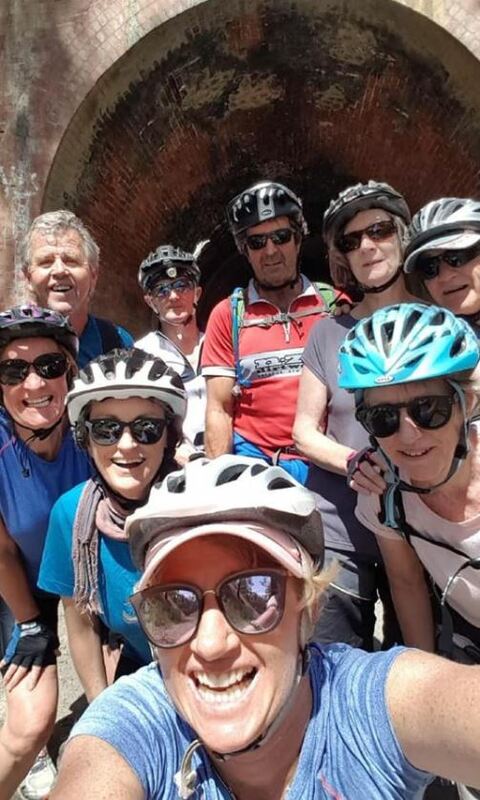 Just a short 22 km round trip ride in 34 deg heat to find the nearest pub. The pub was closed for renovations and only ice-cream and soft rinks were available at the local store. On returning to Trawool and a dip in the spa pool, it was time for a BBQ dinner, a version of Rock Quiz by Simone and Yellow Jersey presentation to Kath for riding all week with a painful strapped up shoulder, but always smiling. An early breakfast and bus ride back to Mansfield to pick up the cars and head for home. 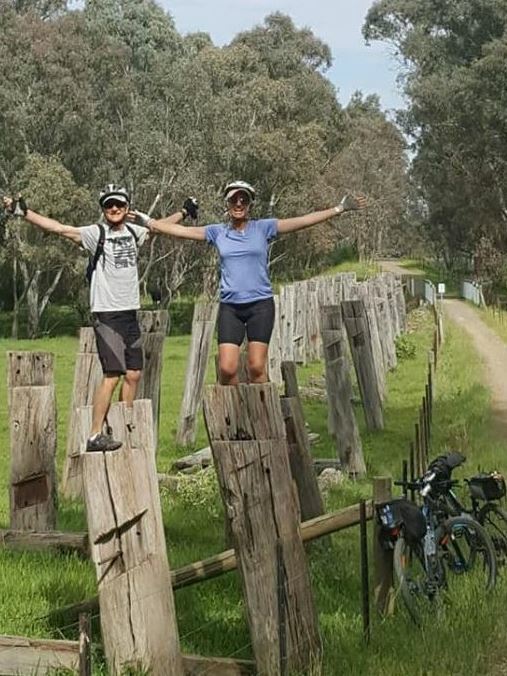 Over the four days of riding, race stage wins went to Big John White, Robbie and Simone. Paul spotted snakes galore and kindly moved back and forth through the pack to check the slower riders. Nikki being from NZ thankfully didn’t see the snakes. Heather turned on a surge of speed to outpace a charging farm dog. 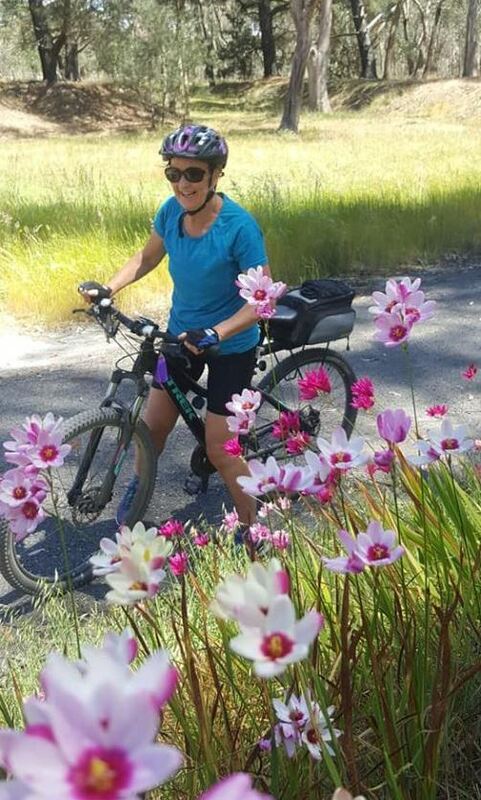 Jacqui and Kath set a hot E Bike pace up the hills for John to chase. A wonderful week away! Thanks Heather for planning the whole trip, Simone for your entertainment (never a dull moment) and everyone for your great company! Credits. Commentary: John L. Pics: John L., Heather and Simone. Click on images to enlarge. Yellow jersey awarded to the rider who spotted the Koala.